Shannon Airport (Irish: Aerfort na Sionna) (IATA: SNN, ICAO: EINN) is one of Ireland's three primary international airports, along with Dublin and Cork. In 2017, 1.751 million passengers passed through the airport, making it the third-busiest airport in the country after Dublin and Cork. 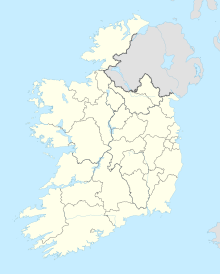 Shannon Airport is located in Shannon, County Clare, and mainly serves Limerick, Ennis, Galway and the south-west of Ireland. The longest runway in Ireland, at 3,199 metres (10,495 ft), is located at Shannon, which was a designated landing site for the Space Shuttle. In the late 1930s, transatlantic air traffic was dominated by flying boats, and a flying boat terminal was located at Foynes on the south side of the Shannon Estuary. However, it was realised that changing technology would require a permanent runway and airport. In 1936, the Government of Ireland confirmed that it would develop a 3.1-square-kilometre (1.2 sq mi) site at Rineanna for the country's first transatlantic airport. The land on which the airport was to be built was boggy, and on 8 October 1936 work began to drain the land. By 1942 a serviceable airport had been established and was named Shannon Airport. By 1945 the existing runways at Shannon were extended to allow transatlantic flights to land. When World War II ended, the airport was ready to be used by the many new post-war commercial airlines of Europe and North America. On 16 September 1945 the first transatlantic proving flight, a Pan Am DC-4, landed at Shannon from Gander. On 24 October 1945, the first scheduled commercial flight, an American Overseas Airlines DC-4, Flagship New England, stopped at the airport on the New York City–Gander–Shannon–London route. An accident involving President Airlines on 10 September 1961 resulted in the loss of 83 lives. The Douglas DC-6 aircraft crashed into the River Shannon while leaving Shannon Airport for Gander. The number of international carriers rose sharply in succeeding years as Shannon became well known as the gateway between Europe and the Americas; limited aircraft range necessitated refuelling stops on many journeys. Shannon became the most convenient stopping point before and after a trip across the Atlantic. Additionally, during the Cold War, many transatlantic flights from the Soviet Union stopped here for refueling, because Shannon was the westernmost non-NATO airport on the European side of the Atlantic. On September 30, 1994 Shannon was the site of the "circling over Shannon" diplomatic incident involving Boris Yeltsin. Ryanair increased services and passenger numbers at the airport through 2008. In 2007, Shannon carried 3.2 million passengers. However, after a disagreement with the Dublin Airport Authority (DAA) in 2008, Ryanair announced that the number of based aircraft would reduce from four to one and 150 jobs would be lost. Services were cut by 75% and 32 Ryanair routes from the airport were reduced to eight. CityJet launched a twice-daily route to Paris Charles de Gaulle Airport in 2008 when Aer Lingus closed its London Heathrow flights. The company based an Avro RJ85 at Shannon. More services were under consideration, including a route to London City Airport; however CityJet pulled out of Shannon in October 2009 after Aer Lingus reinstated its Heathrow flights. In March 2013, the new company appointed Neil Pakey as its first CEO. Traffic figures for June 2013 report an 8% increase on the previous year, the first time a traffic increase has been recorded in three years. On 21 March 2013, Ryanair announced a new twice-weekly route to Alicante, Spain to begin on 5 June for the summer months. That brought Shannon's total to 33 seasonal scheduled summer routes. In August 2013 Aer Lingus announced a 1x weekly service to Lanzarote every Saturday during the winter months using an A320. In October 2013, United Airlines confirmed it will increase capacity by 88% on its Shannon-Chicago route for 2014. In late 2013, Aer Lingus announced 2 new routes to Málaga, Spain (two weekly) and to Bristol, UK (one daily). Ryanair also announced 8 new routes from Shannon to continental Europe. The new routes began from the start of April 2014, and a second Boeing 737-800 was based at Shannon to accommodate the extra 300,000 passengers a year it would bring in. The destinations announced were Berlin Schonefeld, Beauvais, Memmingen, Warsaw Modlin, Kraków, Nice, Faro, and Fuerteventura. On 4 July 2014, the "Bank of Ireland Runway Night Run" featured 1,200 people running along Shannon's runway to raise money for charity. In late 2014, Aer Lingus Regional operator Stobart Air said that they would close down their Shannon base in early 2015. They returned in June 2015 operating 6 flights weekly Birmingham service followed by 6 flights weekly Edinburgh service. In late 2015, they announced a new CEO for Shannon, Matthew Thomas. Ryanair announced that it will be ending its Paris and Memmingen routes in late 2016, and it also reduced its Manchester and London Stansted routes. Ryanair is aiming for 720,000 passengers in Summer 2017 even though that they were close to 800,000 in Summer 2016. In October 2016, SAS announced a new route to Stockholm from August 1, 2017 to October 7, 2017. Shortly after that, Lufthansa announced a weekly service to Frankfurt running from April to October in 2017. In September 2017 Ryanair announced a new Route to Reus. It will run through summer 2018 operating 2x weekly (Tuesdays and Saturdays) replacing the route to Berlin. The same day Air Canada announced a new 4x weekly service to Toronto with the Boeing 737 MAX. In February 2018, Ryanair announced it would resume flights to Bristol and Liverpool from May 2018. In late 2018, Ryanair announced a new 2x weekly service to Ibiza, and the resumption of flights to East Midlands, both beginning in April 2019. In 1969, it was announced that a new government agency, Aer Rianta (now the Dublin Airport Authority), would be given responsibility for Shannon Airport. Passenger numbers at the airport reached 460,000 that year. With the increase in passengers and the introduction of the Boeing 747, it was decided that a new enlarged terminal was needed. The first commercial operation of a 747 took place in April 1971, while the new terminal officially opened in May that year. In 1974, a major increase in fuel prices had a dramatic effect on transit traffic. During the 1990s, the airport began to struggle. The bilateral agreement with the United States was renegotiated, resulting in fewer planes being required to stop over in Shannon (see Shannon Stopover below). However, 1996 saw the beginning of Continental Airlines flying between Dublin, Shannon and Newark, New Jersey. With the demise of the Soviet Union in the early 1990s, Aeroflot began to suffer, which was a big loss to the airport. Aeroflot had brought 250,000 passengers a year through Shannon. Shannon began to rebound in the late 1990s with the success of the Irish economy, the improving situation in Northern Ireland and an influx of American tourists. By the end of the decade Shannon had passenger numbers of 2.2 million and in the year 2000, a new £40 million terminal extension was opened. Shannon continued to expand during the Celtic Tiger years with many services operated to the U.S. and Canada. The first Air Services Agreement with the United States in 1945 only permitted flights to Shannon and only permitted Irish airlines to serve Boston, Chicago and New York. In 1971, the US Civil Aeronautics Board announced that unless US planes were allowed to operate into Dublin Airport they proposed to ban Aer Lingus from landing in New York. Eventually an agreement was reached which allowed one US carrier, TWA, to service Dublin Airport through Shannon. In 1990, the U.S.-Irish bilateral agreement was changed to allow Irish airlines to serve Los Angeles and additional U.S. airlines to serve Dublin via Shannon. An amendment in 1993 allowed airlines to provide direct transatlantic services to Dublin, but 50% of transatlantic flights had to either originate or stop over in Shannon. In 2005, an agreement was reached regarding a transitional period. Beginning in November 2006 and ending in April 2008, the agreement gradually eliminated restrictions on cargo services. For passenger service, it reduced the stopover requirement and allowed Irish airlines to serve three additional U.S. destinations. Furthermore, it was agreed that at the end of this period, no restrictions would be placed on scheduled services between any airport in the one country to any airport in the other. In 2007, the European Union and the U.S. announced that an agreement had been reached on an open skies aviation policy. The agreement came into effect from 30 March 2008. This effectively led to the complete abolition of the Shannon Stopover, although this would have happened under the 2005 agreement anyway. In 1947, the "Customs Free Airport Act" established Shannon as the world's first duty-free airport, a move promoted by Brendan O'Regan; although "duty-free" shopping is not applicable any more for flights within the European Union, EU-bound passengers can still buy goods, but have to pay the normal taxes. Shannon became a model for other duty-free facilities worldwide. For most goods, passengers can buy the same goods regardless of their destination: the only difference will be made in charging VAT at check-out. An exception to this are tobacco products, as all tobacco products sold in Ireland need to have an excise stamp, while this does not apply for "real" duty-free tobacco. As the prices for tobacco in Ireland are among the highest in the world, there is little or no demand for tobacco at Irish airports for EU flights. Shannon Airport has a history of foreign military use. A large part of its business in recent years has been military stopovers, currently almost all American; however, the airport was also frequently used by the Soviet military until the 1990s, since Ireland, having a traditional policy of military neutrality, was not a member of NATO. There were some restrictions, such as being unarmed, carrying no arms, ammunition, or explosives, and that the flights in question did not form part of military exercises or operations. Shannon saw military transports throughout the Cold War and during the first Gulf War. In the aftermath of 11 September attacks, the Irish government offered the use of Shannon to the US government. When the United States invaded Iraq in 2003, the government still allowed United States armed forces to use the airport. This caused much controversy and was the subject of protests and a challenge brought to the High Court. In January 2003, a woman took an axe to the nose cone and fuselage of a US Navy 737 BBJ, piloted by M. Callaway; however, a trial ended in her acquittal. In February 2003, a group known as the Pitstop Ploughshares damaged a United States Navy C-40 Clipper aircraft at the airport. They were tried three separate times and ultimately ended up also being acquitted. As of November 2008, approximately 1.2 million troops have passed through Shannon since the beginning of the Iraq War. This has generated significant revenue for the airport and has offset the loss of flights from the end of the Shannon stopover and the general downturn in the global aviation industry. In 2012–2013, the military flight contracts are held by Omni Air International, which uses Boeing 767 and 777 aircraft,  Sun Country Airlines, which uses 737-800 aircraft, and North American Airlines, which uses Boeing 757s. In 2014, only Omni Air International operated troop transit flights, with an average of 1-2 flights per day. In January 2014, 79-year-old writer and anti-war activist Margaretta D'Arcy was sentenced to three months in prison for scaling the perimeter fence of Shannon Airport in October 2012 in protest at the use of the airport by the US military. Former Sinn Féin leader Gerry Adams and Independent TD Clare Daly called for her release. On 6 December 2005, the BBC programme Newsnight alleged that Shannon was used on at least 33 occasions by United States Central Intelligence Agency (CIA) flights, thought to be part of a US policy called extraordinary rendition. The New York Times reported the number to be 33, though referring to "Ireland" rather than Shannon, while Amnesty International has alleged the number of flights to be 50. Casement Aerodrome has seen similar claims. The United States and Ireland have denied these allegations. The current airport terminal was opened on 27 March 2000 by then Minister of Transport Mary O'Rourke. This facility has 40 check-in desks, 5 baggage carousels and 14 boarding gates (including 6 airbridges). There are nearly 20 aircraft parking stands. The car parks can hold 4,200 cars. Much of the older landside section of the airport has been renovated with new 'Shannon Airport' branding. An airside area renovation and passenger separation project was completed in Summer 2010. When Eirjet existed, its head office was located on the grounds of Shannon Airport. In 1986 a United States border preclearance facility was opened at Shannon, eliminating the need to go through immigration on arrival in the United States. In November 2008, it was announced that customs and agriculture inspections would be added, making Shannon the first airport in Europe to offer this service, and to enable passengers to arrive on a "domestic" basis. To have these facilities put in place a two-storey, 7,000 m2 (75,000 sq ft) extension to the main terminal building was constructed. The facility opened the morning of 5 August 2009. As of September 2016, Shannon Airport also is the first and only airport in Europe to offer U.S. Customs and Border Protection to private aircraft. British Airways operates a daily business class-only flight from London City Airport to John F. Kennedy International Airport in New York with a stopover in Shannon. This allows them to take off from the short runway of City Airport, which is located in the London Docklands area and stop for fuel in Shannon. However, the flight does not convey passengers originating (or departing) at Shannon. Shannon Airport is the end destination of the N19 national route, which connects to the N18/M18 Limerick–Ennis–Galway route. It is also the western end of European road E20. A dual carriageway section of the N19 was finished in 2004, bypassing the town of Shannon, and a new interchange and dual carriageway north to Ennis were completed in 2007 on the N18 (M18). It is approximately 25 kilometres (16 mi) west of Limerick and around 85 kilometres (53 mi) south of Galway. Dublin is approximately 223 kilometres (139 mi) away and Cork is around 125 kilometres (78 mi) away. Car hire is available in the arrivals hall of the terminal building, with five car rental firms operating at the airport. Private-hire coaches and buses are available from many operators such as Eirebus; these need to be pre-booked and can transport passengers to any destination throughout Ireland. Shannon Airport offers both short-term and long-term parking within the airport with over 5,000 spaces available. All car parks operate 24 hours and are regularly patrolled by Airport Police. Due to the location of Shannon, it receives a large number of emergency stopovers. 16 July 1943 – British Overseas Airways Corporation de Havilland DH91 Fortuna crash-landed short of the Runway 14 threshold. There were no injuries. 18 June 1946 – an Aer Lingus Douglas DC-3, Charlie Alpha, on a domestic flight from Rineanna to Dublin crashed shortly after takeoff with only minor injuries reported. 28 December 1946 – TWA Lockheed Constellation Flight 6963 crashed attempting to land at the airport. 15 April 1948 – Pan Am Flight 1-10, a Lockheed Constellation crashed attempting to land at the airport. 5 September 1954 – Lockheed Super Constellation KLM Flight 633 from Amsterdam to New York City, using Shannon as a refuelling stop, crashed just after takeoff into a mudbank adjacent to the airport. 28 people on board died. 15 July 1956 – a Swissair Convair CV-440-11 crashed on approach to the airport due to pilot error. The aircraft was on its delivery flight from San Diego, California to Zürich via New York, Gander and Shannon. The crash killed all four crew on board. 14 August 1958 – Lockheed Super Constellation KLM Flight 607-E from Amsterdam to New York crashed into the Atlantic Ocean after a refuelling stop at Shannon, killing all 99 passengers and crew on board. 26 February 1960 – an Alitalia Douglas DC-7C crashed after taking off from the airport, killing 34 people out of 52 passengers and crew on board. 10 September 1961 – a President Airlines Douglas DC-6 crashed into the river Shannon after taking off from the airport on a flight to Gander. The disaster killed all 83 passengers and crew, one of the worst air disasters in Ireland's history. 30 September 1977 – an Interconair Bristol 175 Britannia 253 overran the airport's runway after severe vibration on the approach. The left wing broke off and caught fire but none of the six crew were injured in the crash. 20 June 1979 – American Airlines Flight 293 landed in Shannon after being hijacked. As Shannon Airport has been built adjacent to the Shannon Estuary, it is likely to have problems with rising sea levels and high waters in the Shannon. The government is working on plans to protect both the airport and the town. ^ EINN – SHANNON/International (PDF). AIP and charts from the Irish Aviation Authority. ^ a b "European Airport Traffic Trends". Anna.aero. Retrieved 28 January 2017. ^ "Monthly Review". Irish Aviation Authority. December 2016. Retrieved 28 January 2017. ^ "State Airports Act 2004". Irish Statute Book. 21 July 2004. Retrieved 8 September 2016. ^ "O'Connell abú ag Aerfort na Sionna" (in Irish). RTÉ.ie. 17 July 2015. Retrieved 8 September 2016. ^ "DTTAS Quarterly Aviation Statistics Snapshot Quarter 4 2017 Report" (PDF). Department of Transport, Tourism and Sport. 2017. ^ "Bank of Ireland Runway Night Run". Shannon Airport. 5 July 2014. Retrieved 28 July 2014. ^ "Growth – Shannon recovers passenger throughput". IHS Jane's 360. Retrieved 15 January 2014. ^ a b Chevalier, Michel (2012). Luxury Brand Management. Singapore: John Wiley & Sons. ISBN 978-1-118-17176-9. ^ "High Court of Ireland Decisions". Bailii.org. Retrieved 15 January 2014. ^ "Almost 200,000 troops use Shannon". Irishtimes.com. 6 November 2008. Retrieved 3 October 2015. ^ "The US Military's International Airlift Contracts". Defense Industry Daily, LLC. Retrieved 3 October 2015. ^ "Gerry Adams calls for release of Margaretta D'Arcy". Sinnfein.ie. 22 January 2018. ^ "Gilmore accepts US assurance of no rendition flights through Shannon". Thejournal.ie. 20 September 2011. Retrieved 15 January 2014. ^ "home." Eirjet. 1 July 2006. Retrieved on 15 September 2010. ^ "Routes at a Glance Summer 2019 Flights by Destination". Shannon Airport. Retrieved 24 February 2019. ^ "Shannon Airport welcomes new Toronto service" (Press release). Shannon Airport. 13 September 2017. Retrieved 13 September 2017. ^ a b c "Flight Timetable". TUI Airways. 18 January 2019. ^ "Cork and Shannon passengers to be bussed to Dublin to catch Norwegian's US flights". TheJournal.ie. 23 March 2019. Retrieved 23 March 2019. ^ "Shannon welcomes another new service for 2019 as Ryanair adds Ibiza to schedule Airport's First Ever Ibiza Service Gives Passengers More Choice". Shannon Airport. 2 October 2018. Retrieved 2 October 2018. ^ "Shannon Airport Traffic Figures". Shannon Airport. Retrieved 17 May 2016. ^ "Passenger Movement by Irish Airport, Direction, Foreign Airport and Month". Central Statistics Office. December 2018. Retrieved 30 March 2019. ^ "Car Rental". Retrieved 29 February 2016. ^ Deegan, Gordon. "Car Rental". Shannon Airport. Dublin. Retrieved 29 February 2016. ^ Woulfe, Jimmy. "Iarnród Éireann to look at feasibility of rail link to Shannon Airport". Irish Examiner. Retrieved 23 December 2013. ^ "Accident description: Lockheed Constellation N86505". Retrieved 23 September 2010. ^ "Clipper Empress of the Skies Accident Investigation Report" Archived 16 July 2011 at the Wayback Machine. Retrieved 23 September 2010.